BRUSSELS, 10 February 2014 – Recupel and the Belgian recycling industry is partnering with the United Nations Industrial Development Organization (UNIDO) and the international non-profit organization, WorldLoop, to support sustainable e-waste management in developing countries in Africa. 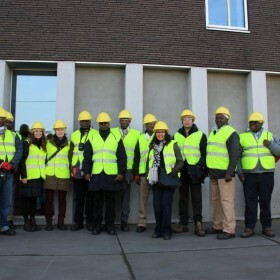 Practitioners from Burundi, Ethiopia, Kenya, Morocco, Senegal, Rwanda, Tanzania, Uganda and Zambia participated in a five-day workshop starting in Brussels the second week of February. The training focused on the best practices and sustainable solutions in the collection, dismantling and recycling of electronic and electrical waste. E-waste is a growing concern internationally, particularly in regions of the world that do not have readily available and environmentally friendly treatment options. WorldLoop and UNIDO have entered into a partnership to tackle the problem in developing countries. The two organizations agreed to organize e-waste recycling training courses to improve efficiency and resource-recovery in the field and are bringing together industry leaders to lead the course. At present, while many of those involved in countering the problem of e-waste understand the basics of proper dismantling and handling, few know how to run a recycling centre. The goal of the training is to demonstrate best practices within e-waste dismantling and to show how to best organize and run a dismantling facility. After the training the participants will be able to improve the dismantling operations at their facility and have a clearer picture about the requirements of an internationally recognized dismantling facility. This workshop is organized together with Recupel, OVAM, The WEEE Forum, Galloo, Arrow, Coolrec, and Umicore. “As one of the leading organisations in the collection and recycling of E-waste in Europe, Recupel has always been open to sharing its knowledge and experience. As a founding member of the WEEE-Forum, an association of 39 electrical and electronic waste collection and recovery system, Recupel has had the opportunity to welcome several partner-systems from all over Europe to provide a platform for co-operation and exchange. “It is expected that in the near future developing countries will generate more e-waste than developed countries. In cooperation with its international partners, UNIDO supports countries in facing the challenge of managing e-waste. Our goal in this respect is to promote sustainable recycling solutions, including the establishment of recycling facilities which comply with international standards. “Every day we work with entrepreneurs and non-profits in developing countries committed to environmentally friendly e-waste management. Trainings such as these not only support the professionalization for these players but is also act as a catalyst for local growth and development. What the participants will learn can be taken back and shared with others in the local industry, further supporting capacity building initiatives that are taking place around the world.